I really enjoyed this story. I found that this book grabbed my interest right from the start and was a rather solid read until the very end. I found that I wanted the best for these three women and hoped that the choices that they were making would work out for them. I wondered what I would do if I were thrust into the same situation that they were presented with and still haven't decided on an answer. Jesse, Claire, and Gabriela have been best friends for years and have always celebrated their birthdays together. 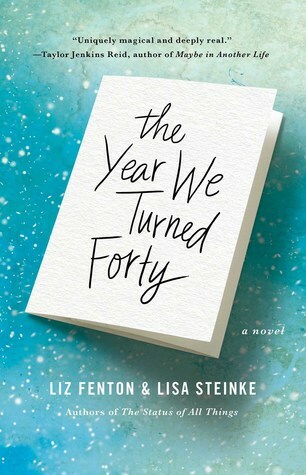 The celebration for their fortieth birthday was one of the more memorable parties since it ended with Jesse going into labor with her son, Lucas. Fast forward ten years and the trio is celebrating their fiftieth in Las Vegas where they are given the chance to go back and relive the year they turned forty. I loved the concept behind this story. Who doesn't have things in their past that they would love to go back and change? I know I could compile a rather long list of things I wish I had done differently without a problem. These three ladies all of have major things that they want to change. Jesse wants to save her marriage, which fell apart after the birth of her son. Gabriela wants to have a baby. Claire wants to save her mother who died from cancer that year. The changes that they are making create such an impact that other unexpected changes start occurring and they have no idea how to handle everything. I liked these three characters. They were all flawed and made some pretty big mistakes in their lives. I found Jesse and Claire to be my favorites of the group. Gabriela was so focused on her single goal of having a baby that she pushed everything else aside. Jesse wasn't able to change the biggest obstacle to saving her marriage but she could change how she handled things. I wasn't always happy with the choices she was making but I understood why she made them. Claire had a lot to deal with and I understood her desperation to save her mother and improve her relationship with her daughter. This was my first experience listening to Lisa Larsen's narration but I think she was a great choice for this story. She was able to capture these three characters along with all of the emotions that they were experiencing. I found her voice to be very pleasant and I had no problems listening to her for hours at a time. I would recommend this book to others. I thought that this was a thought-provoking story of three friends trying to repair some of the mistakes in their lives. There were no easy fixes in this story and all of the changes they accomplished took a lot of hard work. I wouldn't hesitate to read more from this talented writing pair in the future. I received a digital review copy of this book from Atria Books via NetGalley and borrowed a copy of the audiobook from my local library via Hoopla. It seems like there are quite a few books that they have writter together. How was Girls Night Out? I liked it but didn't love it, mainly because of the main character Ashley. She was a smart woman who seemed to make some dumb decisions and I almost thought she was TOO reckless, in a way? But I loved the setting in Mexico and I thought the authors did a good job of examining the three womens' friendship, pitfalls and all, so all in all not bad! I will have to keep my eye out for it. It sounds like something I might enjoy. I really liked this one too! The premise was fun. Great review! If only life were so simple as going back and correcting our mistakes. Interesting premise and based on your review I can see the story was good. I wonder if I would change anything. I have made a lot of mistakes but I like where I am now. I really like flawed characters and hey, we'd all like a do-over every once in a while right? I love the premise. I can so relate. (Smacking my hand on my forehead, thinking of all the do-overs I wish I could take!) Thanks for reviewing this one. I have made so many wrong turns over the years. I can't help but wonder what I would do differently if I could do over a year--40 or some other year. I love the premise of this book and will definitely have to give it a try. I wonder which year I would consider changing. There are so many things I would change if I could go back! I'm super curious to hear how it all changed. Especially with the ruined marriage. I want to know enough that I just requested the library copy. Wonderful review, Carole! I listened to this one back in 2016, and I also enjoyed it. The premise is one I always enjoy, when it's done right, and I felt like Fenton did it well. The idea that what you really want or need is right in front of you, and you don't realize it until it's gone, was something that really stayed with me. They did do a great job with this one. I love that the message has stayed with you. This does sound like an interesting story. I would love to go back and make a few changes to my life, not that I can really complain about where I ended up. Glad you enjoyed this book. Those are my thoughts. I have done some dumb things but like where I am now. I do have things before my 40th that I would like to change, but then I wonder whether I would still end up where I am now. I wouldn't want my current life to be significantly different! I am right there with you, Stephanie Jane. I would never want to change anything in my past because then I wouldn't remember what I learned from the situation. I'm glad you enjoyed this one and that it doesn't seem like everything was wrapped up easily in a bow. In this story they remembered everything which was a nice twist.